The area now called Fairfax was originally part of the Mexican Land Grant, Canada de Herrera, consisting of 6,658 acres, conferred to Domingo Sais on August 10, 1839, in return for his military service under the government of Mexico. One of the first Europeans to settle in the area was a Virginian, Dr. Alfred W. Taliaferro, Marin's first and most beloved physician, who was given the park-like glen, the Marin Town and Country Club property, by Domingo Sais. A fellow Virginian, Charles S. Fairfax, also fell in love with the property when he paid the good doctor a visit. Taliaferro transferred the property to Fairfax and in 1855 Fairfax and his wife, Ada, made it their home. The town of Fairfax derives its name from Lord Charles Snowden Fairfax, tenth Baron of Cameron, Scotland, whose British ancestors were given the grant of land by the British Crown which became the province and then the state of Virginia. Charles was lured west by the gold fever. Here at his estate, known as "Bird's Nest Glen", he dispensed hospitality in the grand old southern style to those of reputation and to the stranger who happened along. 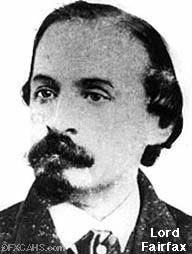 Active in local, state and national politics between 1851 and 1868, Fairfax was elected a Marin County Supervisor in 1865 and held that office for two years. In 1861, a political dispute led two men, Daniel Showalter and Charles Piercy, to the Fairfax home to settle the matter. A personal friend of both men, and ever the diplomat, Fairfax served them lunch first, all the while trying to dissuade them. It was to no avail. The combatants walked from the estate, down the open fields to William Murray's pasture, crossing the creek to a grassy meadow where the former Yolanda-Lansdale School was built. Here a duel ended the life of Charles Piercy at the hand of Daniel Showalter. A man of honor, fiercely patriotic, never coveting his noble title, Charles Fairfax died in 1869 after traveling east as a delegate to the National Democratic Convention, at the home of his mother. After his death, his widow sold the property to Mary Owens and moved to Fort Ross. serenaded the guests dining below. 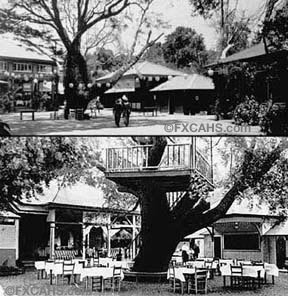 In the 1890's the former Fairfax home became a hotel and restaurant, Pastori's, becoming as renowned as "Bird's Nest Glen" had been when Charles and Ada Fairfax owned it. Its excellent food, service and setting attracted clientele from near and far, the elite from San Francisco and the famous from across the country. In 1911 the restaurant burned to the ground, destroying the last vestige of the Fairfax home. Madame Pastori immediately rebuilt in an even grander style. This building still stands today on the Marin Town and Country Club property. Marin Town & Country Club-The Pastori property was purchased by Emporium Capwell in 1925. They operated the resort for their employees and built the first swiming pool in 1927. 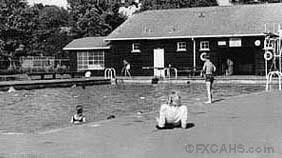 Max Friedman bought the property in 1943, adding swimming pools, dance floors and summer cabins. The Marin Town & Country Club Pool. 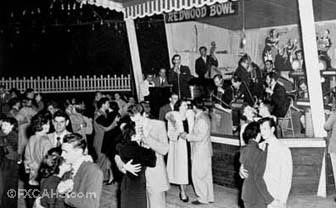 Dancing at the Redwood Bowl at the Marin Town & County Club 1940's. See the Links page to learn more about The Marin Town & Country Club Property. An early scene of downtown Fairfax, looking south, photographed in 1906. Broadway St. circa 1920's At the right is the old Bank of America building. In 1876 the residents of the Fairfax District petitioned and were granted their own school district, the boundaries being those of the former Sais Rancho. P.K. Austin, Salvadore Pacheco and George Hubbard were the district's first trustees. Above is the first Fairfax school built in 1908 within the present city limits, near today's St. Rita's Church. 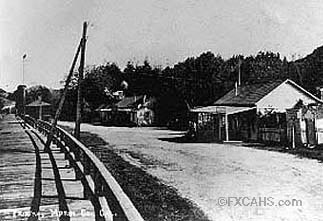 (The first three "Fairfax Schools" were built in Sleepy Hollow). Central School in the early 1920's The stone wall still stands at the site of School Street Plaza. It was after the turn of the century that the Fairfax District began to grow, laying the foundation for the present town. 1907 and 1908 saw three tracts of land subdivided, the Fairfax Tract at Pastori's Station, Ridgeway and Deer Park. In 1910 the Fairfax Improvement Company placed the Pacheco Tract on the market, the Fairfax Development Company subdivided the Fairfax Manor Tract in 1911 and the same year, Henry Frustuck subdivided the Fairfax Park Tract. The Rocca Brothers developed Fairfax Heights in 1912 and 1913 saw the Bush annex, Bothin Park and Manor Tracts come on the market. The last of the original subdivisions making up the town at the time of incorporation was The Cascades, subdivided in 1914, with additions in 1921 and 1926. 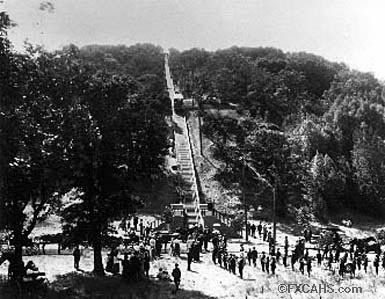 Fairfax Manor saw the advent of the Fairfax Incline Railway which was built in 1913 to help sell lots on Manor Hill along Redwood, Spruce, Scenic and Tamalpais Roads. At a nickel a ride, the railway was very popular and the view from the top breathtaking. By 1929 the line was ruled unsafe and was finally scrapped in 1930. 1913 Opening Day - The incline railroad located on the hill behind Fairfax Lumber was built to sell hillside lots. 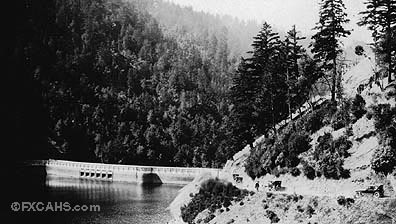 With the beginning of construction of Alpine Dam in 1917, labor was in demand. Into the area came a large number of Italian laborers and for a long time the term "Little Italy" was synonymous with Fairfax.